Otomedia, a Japanese magazine primarily directed at women 18-40, is bringing its readers a surprise in its June issue. 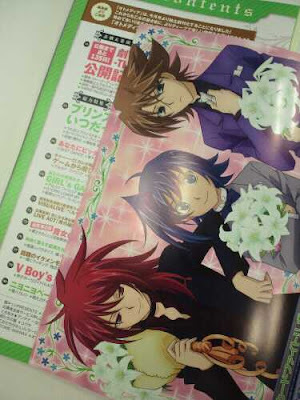 A poster insert features Vanguard's three leading men dolled up in tuxedos and holding the series' trademark lilies. The artwork has drawn much attention on tumblr, where the fanservice is driving the magazine's audience wild. The inclusion may seem unusual for a girl's anime magazine--Otomedia is not the type to normally showcase hobby anime. However, other information suggests that this can be seen as a response to Vanguard's actual viewership. At the Big Vanguard Fest this May, bracelets, hair scrunchies and T-shirts designed for women were sold; Yonaga Tsubasa and Satou Takuya featured them on their night-time radio program, Tachigare! Bokura no Vanguard, a general-audiences Vanguard talk show. Supporting these recent developments, several women's-only double-elimination tournaments are being launched in Japan, with the most recent one currently reaching across 14 of Japan's 47 prefectures. As this is coming about in the wake of female pros like Kakuhara Misaki and Asano Ami rising to prominence in regional events, the push to expand Vanguard's target demographics is likely no coincidence. Follow Cardfight Pro on social media!